A youth minister at church (and very dear friend Katrina) asked me to make a Rapunzel costume for an event going on at our parish. Well I only had a week’s notice and I wanted to work on a limited budget, so refashioning seemed like the way to go. Good thing I got lucky finding a dress at the Goodwill!! All I had to buy were some trims and purple fabric to spruce it up. My friend Gabi and I agreed that it’s reminiscent of Cinderella’s first dress. You know, the one her sisters destroyed. One of my favorite parts of that movie was watching the mice sew. Maybe that’s why she’s my favorite princess. 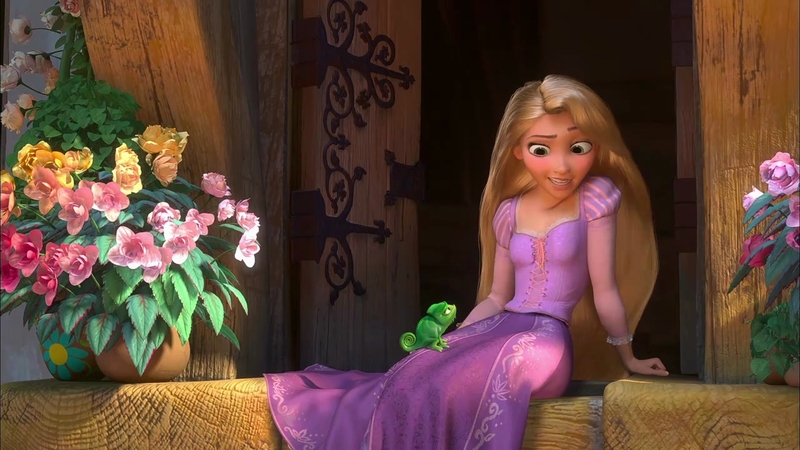 Anyway, we’re here to talk about Rapunzel. I wasn’t striving to make it exactly like Disney’s version, ’cause I don’t like to stress myself out, so I went for more of a resemblance. Hopefully as long as the colors and cut are similar, people won’t mind. 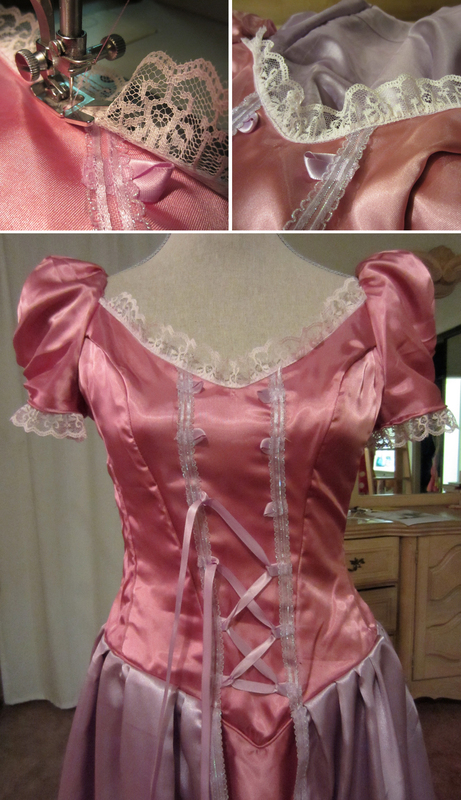 First I removed the bow and the decorative gathering on the bodice. I shortened the sleeves as well. 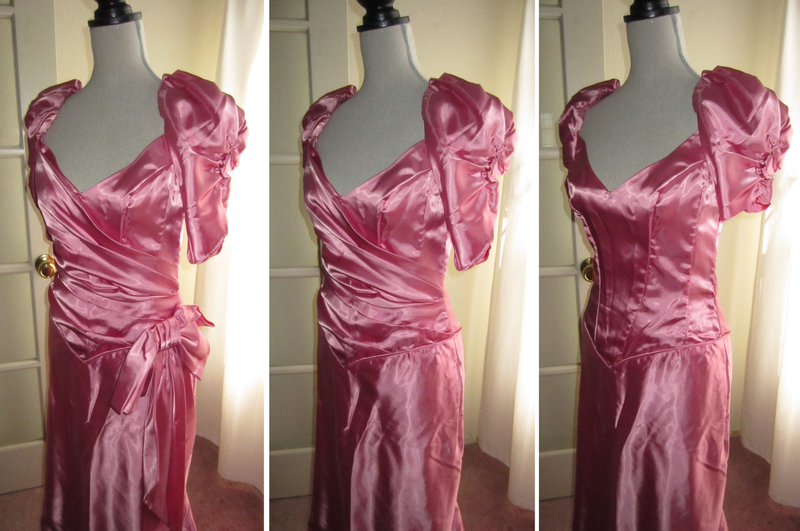 I pinned the purple fabric onto the mannequin so I could get some measurements. 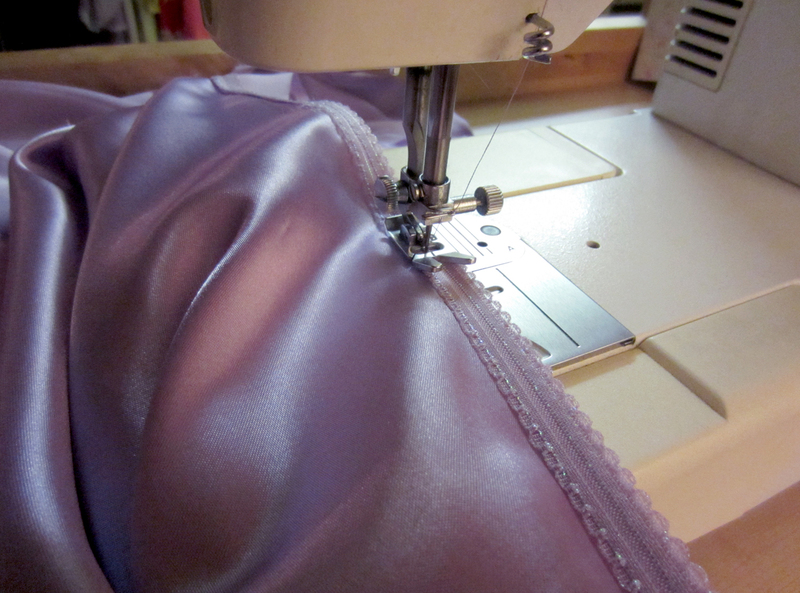 Then I went on to sew some trim onto the purple fabric for some extra pizazz. I was NOT about to try to hand embroider the floral design on the Disney version. Or pay the money for a trim that intricate. Afterwards I attached the purple fabric to the dress and worked on other details: a faux corset closure, lace trim on the neckline and sleeves, and ribbon on the sleeves for a striped effect. The lovely Emily in character. I got that flower headband in the 3rd grade! See? This is why I don’t throw things away. Thanks for taking photos Katrina! Amazing transformation!!!! You are a true sewing genius! I’m in awe! Thank you Mary! I bet your daughter has some fun alterations of her own! tracy… i love you even more now. make me all the princess dresses!!!! You really did a great job, beautiful dress ! Thanks so much for sharing this! I am going to try this for my daughter. We’ve been looking for a Rapunzel dress. I’m glad you like it! It was a donation for my church’s youth group, so unfortunately it is not. 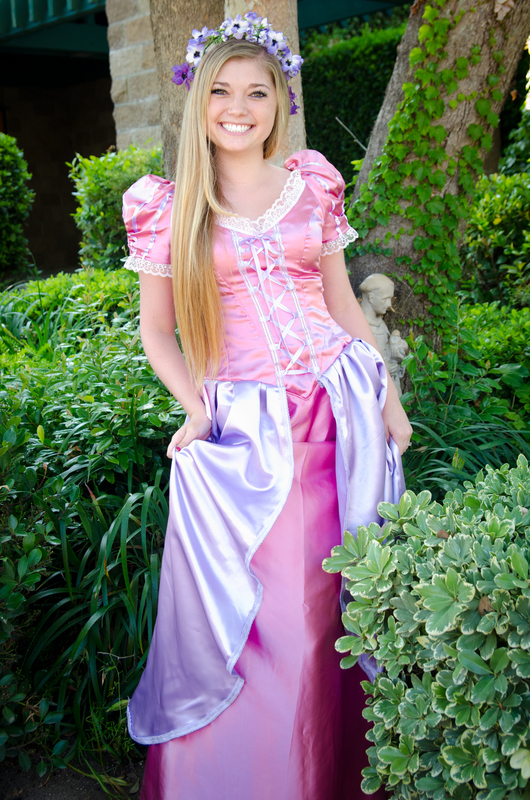 Amazing – you did a great job creating (and explaining) all the steps involved in creating this lovely Rapunzel costume. In case you and your readers didn’t know, there is a Creative Costume Contest over at http://www.halloweenhero.com/costume-contest-2013.html and there is a $250! You may enter more than once as long as each entry is for a different costume. Thanks again for sharing this tutorial – I probably couldn’t do it myself, but it’s beautiful to look at your original creation. This is awesome! 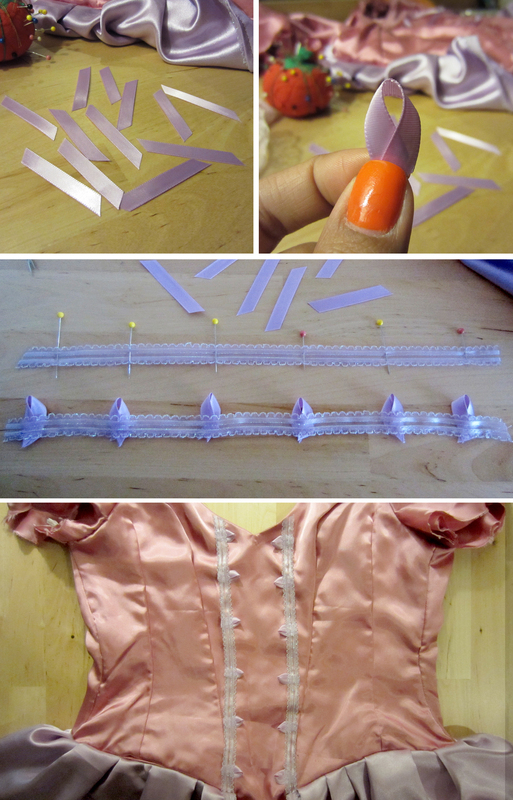 I’ve been looking for a way to make a corset-looking top without making a corset. This is perfect. 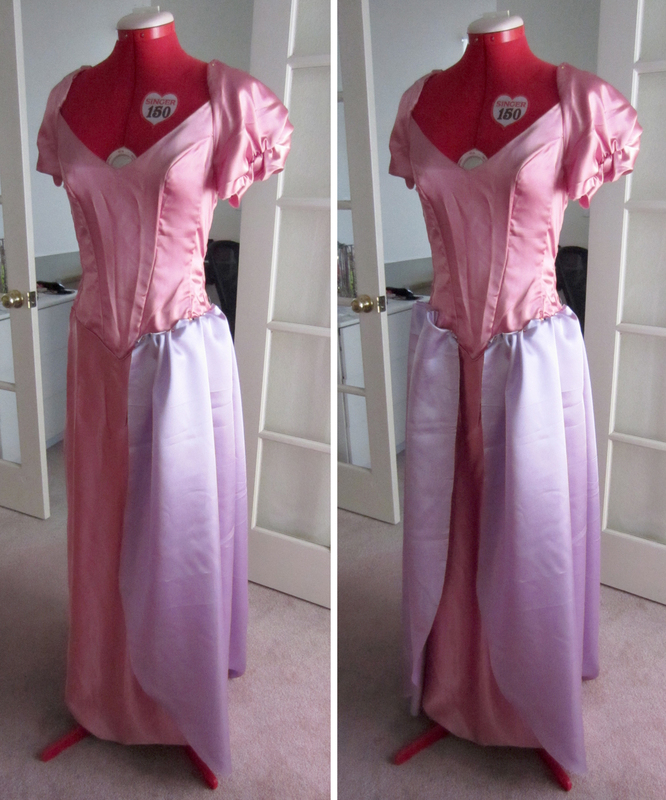 I’m making my 3 year-old a “pink and purple princess dress with a beautiful skirt” for Halloween. Now I can’t wait to get started. And a little trim and some ribbon (possibly even from my stash) will be so thrifty. Thanks so much for a wonderful tutorial! wow!!!!!! by any chance will you be able to make another? 🙂 please x i will definately buy it off you! 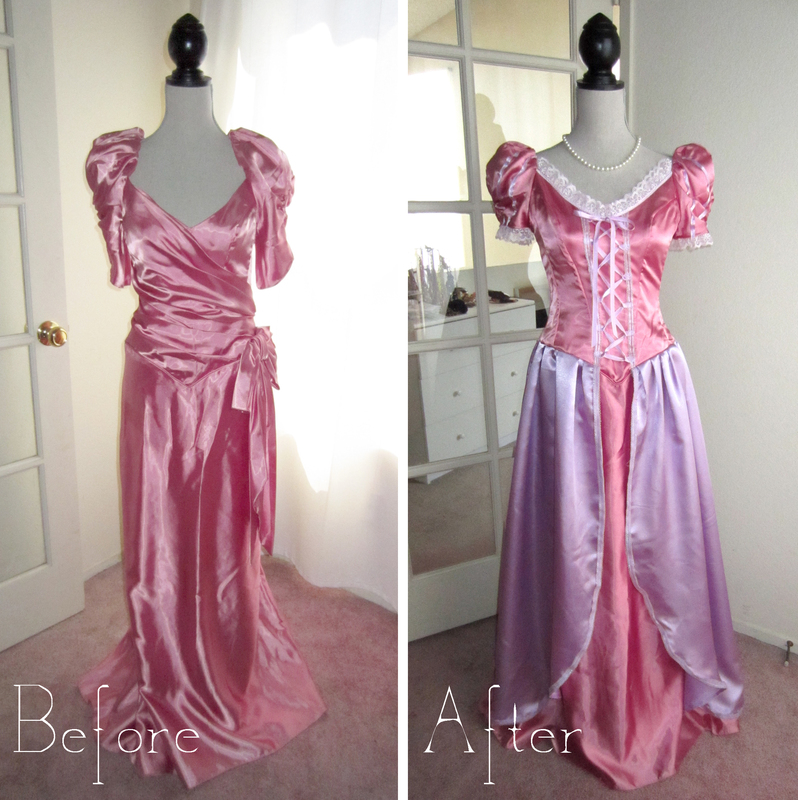 Unfortunately I won’t be able to make another because I can’t guarantee that I’ll find the right kind of dress again. Thank you for stopping by! ahh i really wanna have a dress form/mannequin to sew on but they’re too expensive 😦 where did you get yours and for how much? 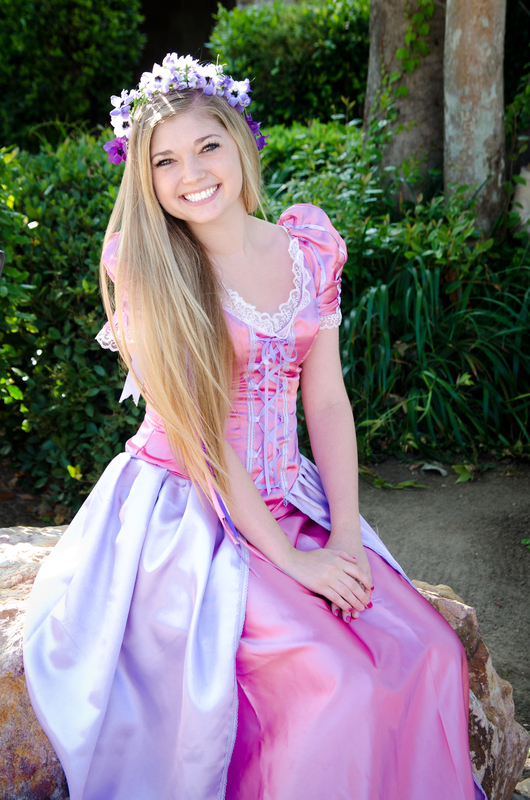 Absolutely gorgeous dress and Rapunzel! Great job. 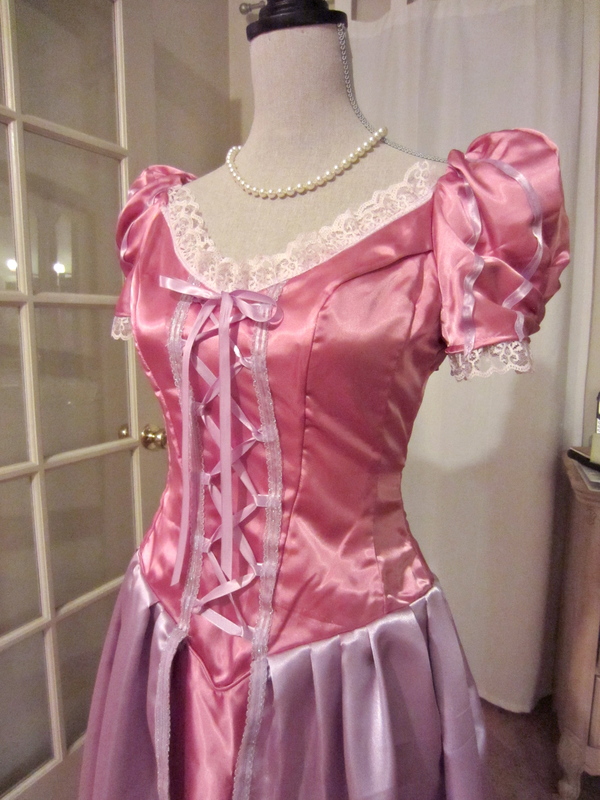 I’m wondering if the bodice under the decorative gathering was like that, or did you have to redesign and sew it? You did an amazing job! Unfortunately it is no longer in my possession.